While anything we say regarding any aspect of Mormonism will be dismissed as “infinitely facile” by critics not interested in dialog, the question does deserve a response. In spite of many evidences for the Book of Abraham as an ancient document, there are definitely some trouble spots, and the most problematic in my opinion are the names given in Facsimile 3. 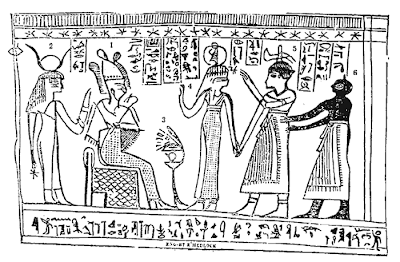 Figures 2 and 4 in that drawing are identified by Joseph as Pharaoh and the prince, respectively, but they are obviously female. Is he blind? Further, he dares to refer to the written text above the characters and states that these identities are “given,” “written,” or “represented” there. But now that scholars can read Egyptian, they have pointed out that Joseph wasn’t even close. The characters above those Figures 2 and 4 state that they are “Isis the great, the god’s mother” and “Maat, mistress of the gods,” definitely not “King Pharaoh, whose name is given in the characters above his head” and “Prince of Pharaoh, King of Egypt, as written above the hand.” As the critics say, here we have a simple test of his ability to read Egyptian, and it would have been easy here for God to simply prove to the world that his prophet could read Egyptian by inspiring him to write something like “The goddess Isis” and “The goddess Maat” for these figures. Instead, we have a “translation” that not only misreads the literal text, but also totally misses the obvious gender of the drawings. Any ordinary farmboy could at least have gotten the gender right, but not Joseph. End of story? If you’re looking for a reason to reject Joseph and the Book of Abraham, this is the perfect place to start. Yes, he failed to render the names Isis and Maat. He even got the genders wrong. Regarding the gender problem, Hugh Nibley has writtenthat ritual dramas in which a man dressed as a female deity are known in Egyptian lore, but even if we accept that a gender-transforming lens can be applied in some kind of Egyptian role playing scenario, is there any reason to believe that Isis could somehow represent Pharaoh and Maat could represent the prince? Joseph gave us specifics that don’t make sense, at least not at a literal level. Latter-day Saints recognize the possibility of human error whenever mortals are involved, and understand that Joseph and other prophets make mistakes. Is that the case here? Perhaps. But there may be something more interesting. Perhaps Joseph’s exercise was not about the literal representation of these figures, otherwise he surely would have said something about women rather than men. Perhaps he is seeking to understand what Facsimile 3 symbolized rather than its literal meaning. One of the king’s main obligations to the god was to rule the land in accordance with maat, the interconnected concept of cosmic balance and truth that was personified by the goddess Maat. The commitment to maat is illustrated by offering scenes where the king presents a figure of the goddess Maat to the deities as a visible affirmation of his just rule and the acknowledgement that he will uphold the tenets inherent inmaat. In the New Kingdom, the king’s coronation name was often compounded with Maat, another indication of the association of the king and principle of truth. 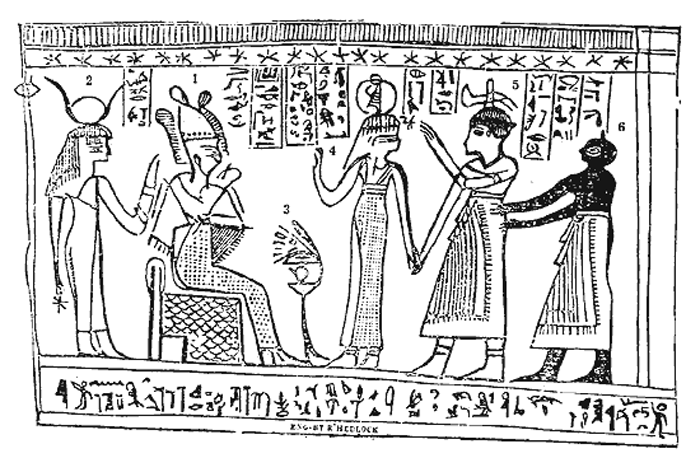 Some New Kingdom kings are shown presenting a rebus of their name captioned “presenting Maat,” suggesting that the king himself was imbued with or personified, Truth. I could be way off and welcome your feedback. I know little about Egyptology and have just relied on easily found sources here that may be inadequate in many ways. It’s still possible to accept that some egregious errors were made, but the theory that Joseph’s comments are based on symbolic meanings would be fairly consistent with some of the more interesting hits in the Book of Abraham, and consistent with the principle of God not removing the need for faith in accepting scripture. God could have provided manuscripts and literal interpretations capable of gaining peer-reviewed acceptance from the scholarly community with no need for faith. But that’s not how He does things. Faith will always be required. * This entry was also posted at Mormanity. I agree, Jeff, that it is very important to understand Egyptian religion and iconography as the Egyptians themselves understood it, even if that can be terribly complex, and even if many can find this sort of discussion frustrating at best. However, it might be better to set out some basic principles first. 1. As Blake Ostler has pointed out, the gods are ritual stand-ins for the initiate. In this case, Hor is the deceased, whose primary stand-in is Osiris — whose dying and rising pattern Hor hopes to emulate as he passes through the set ritual of death and rebirth. 2. Such illustrations must be “read” the way Egyptologists read them, namely, the words and images are equally important, even though the latter are usually neglected. 3. We have no reason to believe that Abraham himself ever saw this illustration (Fac 3), and we don’t know what sort of illustration he might have used originally, although we have examples of just such an illustration with strong Semitic syncretic influence, e.g., a dynasty 19 sepulchral stele featuring ‘Anath-Nephthys ready for battle and sitting on the throne with the crown of Osiris on her head, receiving her worshipers. The crown of Osiris is, of course, the Зtfw-crown (“wrapped-crown” with ostrich feathers along each side), the very crown worn also by a 9th century Ammonite king. I can send you copies of both of these, if you wish. 4. It is, of course, just in the 18th or 19th dynasty that we first find Yahweh, the God of Israel, being referred to by name in an Egyptian Book of the Dead. 5. We must understand that a wide array of documents was transmitted by scribes for thousands of years in Egypt, and that the very large Jewish community in Egypt was actively transmitting their own traditional documents a the time when the Joseph Smith Papyri were created. As for other Semites (for whom we have examples), use of Egyptian iconography by Jews is not in question. We know it occurred. The only question is how and why particular iconographic choices were made by the Jewish scribes who edited and passed on the Book of Abraham — as an accompaniment to an Egyptian text we do not have.